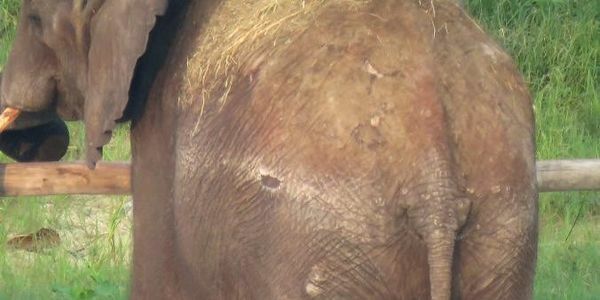 petition: We demand immediate medical investigation and care of the wounded elephant calves, in China! We demand immediate medical investigation and care of the wounded elephant calves, in China! recipient: Cites general Secretary John Scanlon- Chimelong Safari Park Guangdong China- Meng Xianlin, Executive Director general of the CITES Management authorities China! Expert says young elephants recently brought to China from Zimbabwe are covered with wounds. New, secretly obtained photos show that elephants snatched from the wild in Zimbabwe months ago and airlifted recently to China are malnourished, sunken-looking, and scarred by wounds. The calves are covered with so many smaller and larger wounds that no matter what they were caused by, the owners and/or handlers must be held accountable,” The elephants—many as young as four—have protruding cheekbones, lackluster skin, a mottled complexion—which signifies poor condition—and abrasions.“This is a malnourished and wounded female elephant,” says Poole. “Her cheekbones protrude, and her face is sunken around her mouth. Her skin is in very poor condition, discolored, dry. She is covered in many smaller and larger wounds.” See picture! We demand an full and thorough and independent medical investigation and an immediate start of proper care!